My Friend Jason Lozano and I went out on the L. Sac outside of chico yesterday and after transporting a nearly drowned college tuber back to the boat ramp (who the hell goes tubing when it is 70's out and the water is like high 50's low 60's) and being interviewed by the local news on our thoughts about the salmon fishing closure we went fishing. Spent some time throwing flies for some early stripers with only a good bump to show for. Checked some flats for carp and got one to eat but lost it pretty quick into the fight. Then decided to check out some smallie spots and found some nice pods of 2-3lbs smallies eating bait and wrecked havoc on them for a bit. Consumed some Keystone light ($4.50 cheaper a 12 pack than Coors Light and when it is cooler cold you can't tell the difference). All and all another afternoon on one of the coolest fisheries in the world. Spring is here and so is the spring weather, Wind, Warm, Hot, Cold, then perfect...alternating on a daily basis usually. Most of my guiding has been on the Lower Yuba River over the last few weeks. Fishing has been fair to good with any where from 10-30 hook ups a day. 90% of the fish have been coming on nymphs. There are good numbers of caddis (tan and olive 14-16), lil'yellow sallies (12-14), PMD's (16-14), and a few remaining Gray Drakes (12-14). While fish are not keying on the surface they do seem to be keying on the corresponding nymphs. Many days we are changing flies every run to match what we see in the air or on the water. Also if there are no bugs on the water or in the air we match the runs habitat with the types of nymphs we know to be in that water. For example slower runs mayflies, runs with rocky fast riffle water up top stones and caddis. This is an important key on the Yuba as the Macro Invertebrate population is so diverse to have consist ant success one must always analyze the habitat of the given run when picking flies to fish it with. 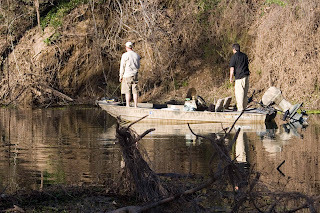 Most of my recreational fishing has been on the L. Sac outside of Chico looking for shad, stripers, and fishing the pre spawn/spawn bite for large mouth and small mouth in the sloughs, creeks, and back waters. I have yet to catch a shad but I know they are coming and with the drop in temperature over the last few days I have turned my attention more towards the bass and carp. This is great time to find carp schooled up in the shallow flats prior to spawning and I have had a few great afternoons casting to both carp and bass in very shallow water. I have heard striper fishing down lower in the river has been good but I rarely make the drive south while the fish interest me the crowds and type of fishing does not. The river sees huge numbers of people for the big migratory push of fish and most of the fishing is casting to rock walls which is not the most fun way for me to catch stripers. I prefer to wait until mid to late June when the resident fish around chico run out of shad to eat and feed in the slough mouths, back waters, and sand flats on anything from bass, pike minnows, bluegill, and even lamp rays.